Available for around $1,199, the new lens features a total of 16 elements arranged in 13 groups, with no fewer than four aspheres and two ED glass elements. It also features a 9-bladed circular aperture; adopts the company’s Nano AR coating to reduce flare and ghosting; and is sealed against dust and moisture. As the first lens in the series to reach 300mm, albeit as a zoom, the lens is optically stabilized — however, unlike some rival models, it lacks any panning or automatic tripod-sensing modes. Autofocus is another area that’s pared back somewhat compared with the company’s high-end G master models, using a linear actuator rather than a direct-drive SSM type. However, the new lens features internal focusing that maintains the overall lens length during focusing and contributes to a lighter overall weight, as well as a minimum focusing distance of 2.95 feet (0.9m). With a 72mm accessory thread, and measuring 3.31 x 5.65″ (84 x 143.5mm) when retracted, the lens is relatively compact. It is also comparatively light in weight at 1.88 lb. (854g). 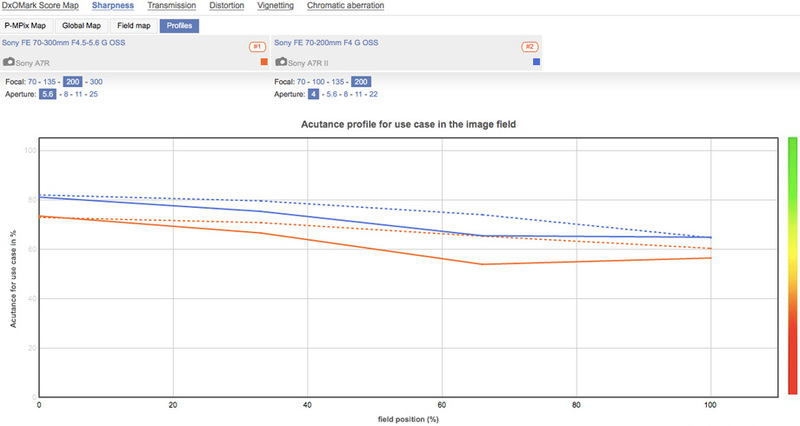 We’ve analyzed the lens on the second-generation, full-frame 42-Mpix Sony A7R II, and are delighted to share the results. 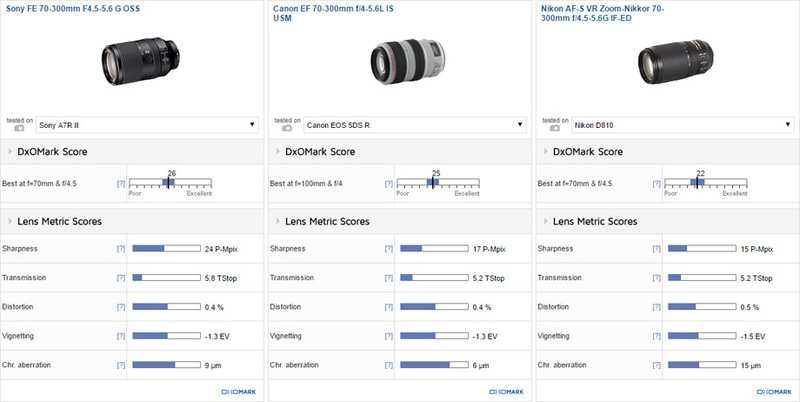 When mounted on the highest output resolution camera in Sony’s lineup — the full-frame 42-Mpix Sony A7R II — the FE 70-300mm f4.5-5.6 G OSS achieved an overall DxOMark lens score of 26 points. That’s an excellent score for a lens like this. It has high sharpness throughout the zoom range, although like most zooms, it’s a better performer at the shorter end. Nevertheless, it is very usable at 300mm even wide-open — but stopping down slightly will reward you. Sharpness is high in a small central core at the initial aperture (f/5.6), and stopping down just one stop to f/8 significantly improves sharpness, not just in the periphery but also right across the frame. Transmission, measured at T5.2-6.3, is comparatively good, while vignetting, distortion, and lateral chromatic aberration are all relatively low. 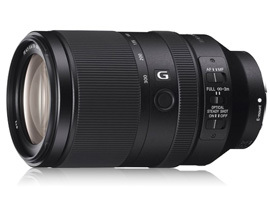 As the first lens in the lineup to reach 300mm, the 70-300mm is a unique proposition; however, for a small premium of around $300, Sony offers the EF 70-200mm f4 G OSS. With a constant f/4 maximum aperture and potentially faster autofocus from dual linear focus motors, the 70-200mm f4 is an attractive tele-zoom, albeit without the reach and without any real size or weight advantage. 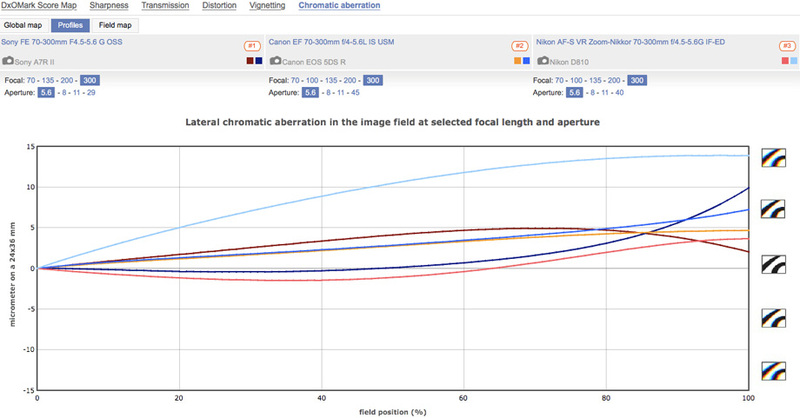 (Indeed, when retracted, the 70-300mm is actually somewhat shorter in length). But for optical quality, the 70-200mm is the better performer overall. It is particularly strong over the 135-200mm range, where it has very high sharpness levels and exceptionally low chromatic aberration. Wide-open, the 70-200mm is sharper both centrally and in the periphery than the 70-300mm at 200mm. 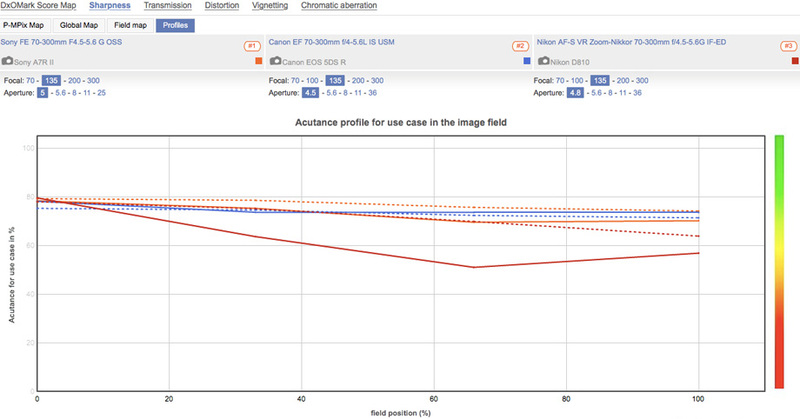 And stopped down one stop to f/5.6, the difference is even more noticeable. It’s not perfect, though — no lens is. 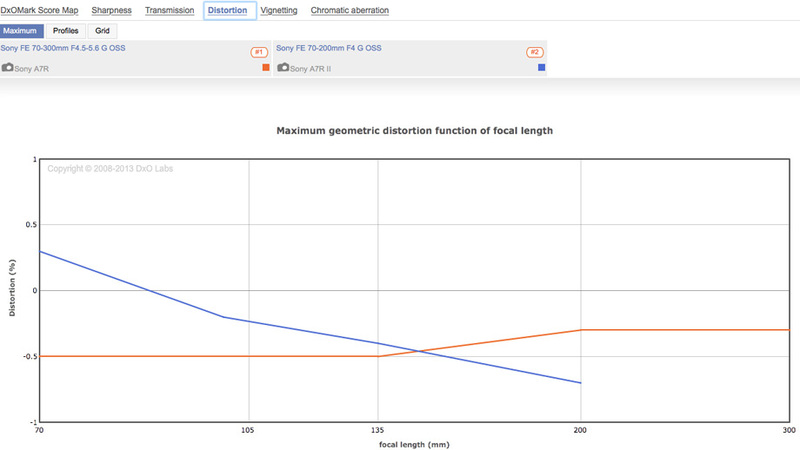 At 70mm, it has rather high levels of astigmatism, though when stopped down a couple of stops it recovers some of its symmetry and imaging accuracy seen at longer focal lengths. It also has more vignetting wide-open and higher levels of pincushion distortion at 200mm. Against rival models from other makers, the Sony is a very competitive performer optically. Indeed, it is a slightly better performer than the $1,600, L-series Canon equivalent, introduced in 2010, and is several leagues ahead of the Nikon. Although a good value at around $670, that model was added to the lineup in 2006, before the maker had even introduced a full-frame camera, and is sorely overdue for a replacement. Besides the generally lower sharpness levels, which is particularly noticeable wide-open at 300mm, the Nikon has poor symmetry mid-range and relatively high levels of lateral chromatic aberration compared to the other two. 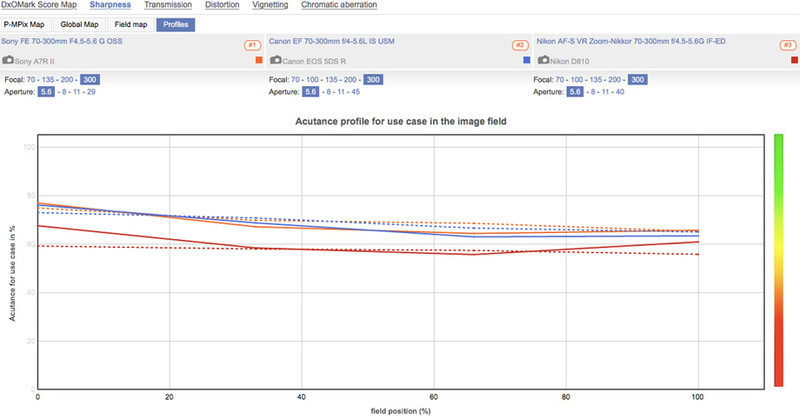 Perhaps unsurprisingly, the newer L-series Canon is the closest in performance. 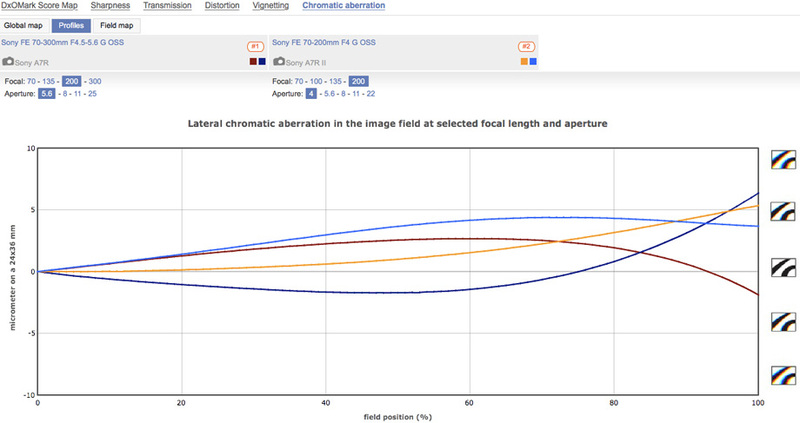 It has very low levels of chromatic aberration, good transmission, and similar levels of sharpness to the Sony, particularly at longer focal lengths. 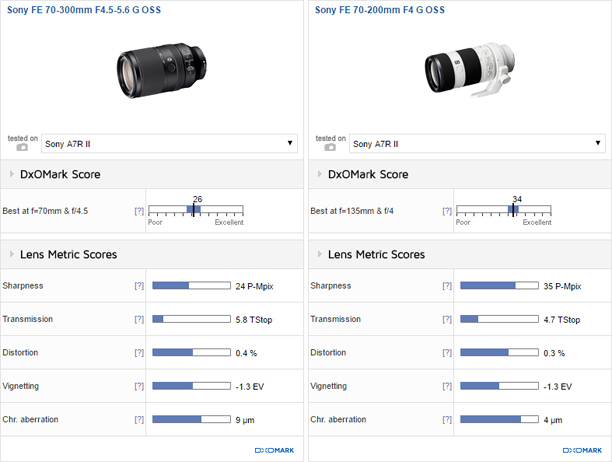 Where the Sony scores well in terms of sharpness, however, is at short and mid-range, but naturally, it’s the longer focal lengths that attract users to the 70-300mm. In terms of optical quality alone, the FE 70-300mm F4.5-5.6 G OSS is on par with the best of its rivals. It has good sharpness at the longer focal lengths, though closing down a stop at 300mm to f/8, when light levels permit, improves levels significantly. While that is a limitation of models like this, this has to be balanced with the extra versatility that they offer over a fixed-focal length 300mm lens. While Sony users still don’t have much choice for longer focal length lenses like this, this model is nonetheless a welcome and attractive addition to the lineup.